A birthday dinner took us south of the river and north of our normal price limit. The Point is a renowned meat restaurant, with sample cuts of their pasture- and grain-fed, eye fillet and porterhouse cuts at the entrance to the restaurant. On this occasion, stopping to peruse these potential meal choices, or heading to the toilets, left diners a little over-exposed to a business function that was pumping out some truly awful sounds: 80s pop (not all of which is bad, I know, but we're talking Whitney Houston) and, even worse, 30-something corporate types belting out hits from their teenage years after a few too many glasses of sparkling. So much for ambience! It was quieter in the restaurant, thankfully. Things remained very quiet around our table. We were in one of the three tables against the back wall and for the first half of our rather elongated stay (3.5 hours) received very little attention from any of the waitstaff. This poor service raised two questions: 1) what is it about certain demeanours - and this happens in hospitality and retail - that say to the staff 'I'm fine, just ignore me and carry on serving everyone else'? and 2) just how much do you have to pay for a meal to ensure that the corollary quality of service comes with it? I could digress at length on the menu, since we were given at least 20 minutes to peruse it, before a waiter remembered us and came over to tell us the specials and belatedly, on request, bring a wine list. I was very tempted by the artichoke baragoule (braised artichokes in white wine and 'aromates') with tomatoes, olives and shallots, but just wasn't convinced it would be a satisfying dinner. The Point Parma - with besan fries, tomato fondue and tarragon jus - was also very tempting. Not to mention the veal blanquette with sauce albufera, which features stock, foie gras, cream, truffle, port Cognac and Madeira! But had there ever been any real chance of me not ordering wagyu? I didn't get the porterhouse ($55) but instead went for the braised wagyu beef cheek, with poached quince and macaroni gratin. The cheek, not surprisingly, doesn't feature the famed wagyu marble, but it's an incredibly soft, tender cut of meat. Here it was served in a rich, sweet sauce that was almost a syrup. The meat itself had caramelised around the edges. 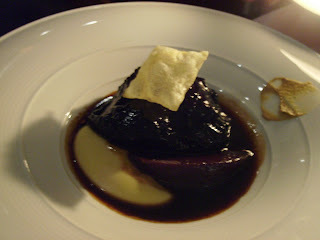 The poached quince had just enough grain and firmness to add an quasi steak-like complement to the melting meat. A pillow of extremely buttery, almost liquid potato mash sat to one side. The combination was delicious when first served but became just a tad too sweet after several mouthfuls. As the meat cooled its texture also became slightly stewy. I did like the balance of colour on the plate: the lone 'macaroni' matching the potatoes and the quince and meat nestling their dark, moon shapes into one another. The Point's menu reserves a separate page for Beef, with most steak dishes accompanied by The Point Garnish of bone marrow and shallot bouchee and a selection of mustards and sauces. 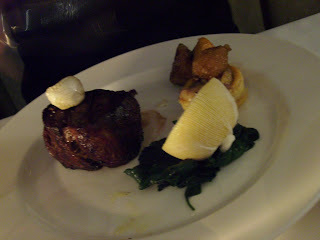 SG chose the 120-day-aged, grain-fed eye fillet. It's a mountainous piece of meat, merrily topped by a whole roasted garlic clove. It was ever so slightly over-seared on the edges, but on the inside, it glowed a rich pink that, in the candlelight, rivalled the glow of red from the wine glass. When one tastes meat handled this reverently, one does wonder why they'd ever touch anything less. We also ordered three side dishes. 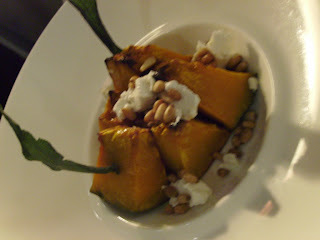 The roast pumpkin with feta, pinenuts and sage came very attractively served: The pumpkin was extremely sweet and the contrast against the goaty feta was quite stark. Chat potatoes, rosemary oil and confit garlic, served in a small La Creuset dish, are definitely worth the $8. The honey glazed carrots we ordered arrived as the broccolini side instead, which we sent back, and had to call over the maitre'd after we'd finished eating everything else to tell him not to worry about bringing that extra dish out. Throwing monetary caution to the wind, we pressed on with a dessert each. 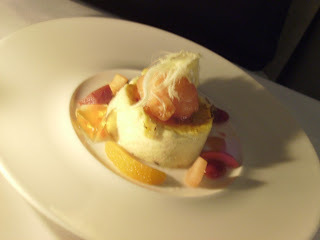 A vanilla bean creme brulee was quite custardy, but the accompanying 'minestrone of autumn fruits' was fine and delicate. The pain perdu was superb. 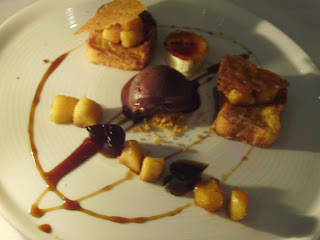 A take on French toast, it featured custard-soaked brioche, caramelised banana, glass biscuits and, most wondrously, Pedro Ximenex and bitter chocolate sorbet. Despite its richness, I couldn't waste a drop of that extraordinary sorbet and used every bit of brioche, banana and biscuit to capture it. Towards the end of the meal our waiter spent some time at the table, apologising about the missing side dish and our long wait for desserts, explaining that early-comers eating slowly and late-comers eating quickly had left the chef in a dither. Particularly with the carrots, I am flabbergasted that a restaurant charging $38 a main, plus sides, could make such a junior-level error, and that the waiter thought we would be appeased by the explanation - if I pay a restaurant that much to cook my meat, the kitchen and floorstaff should be more than adept at getting everything out on time. More positively, we did have a clear view of The Point's famed view over Albert Park Lake and back to the city. Our wine selections were also thoroughly enjoyable: an Italian and Spanish red respectively with the mains and a McWilliams botrytis and PX Cardenal with dessert. I love your blog. You combine two of my favourite things - books and eating out! I can't believe there have been five updates since I last checked and have now sensibly subscribed to your RSS feed. Congrats on the good work and I totally agree with you staff complaints at The Point. This review had my mouth watering! I'm coming to Melbourne in August and I may just have to get your recommendations about where to eat. Hey Rae, that's cool to hear that you're coming down. Always happy to share recommendations when people get the chance to sample our fine range of eating establishments!